Another SSBD successful event. The 3rd of 6 seminar scheduled for 2008. 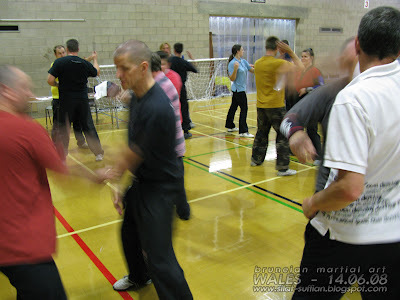 The workshop was hosted and organized by Goshinkwai Total Body Defense's Chief Instructor - Sensei Alun Williams on the 14th June 2008 at Risca, Newport Gwent, Wales, United Kingdom. It lasted 4 hours. I would like to express foremost my appreciation to Sensei Alun Williams and his Total Body Defense Instructors (whom are incredible martial artists in their own rights) for their openness to accept and invite me to instruct a workshop for them - not many martial arts practitioners have thier kind of humility, my highest respects for them. To those helping me in the drills and demos. To those participated and those that travelled from outside of Wales, from York, Cambridge, etc. My sincere apologies if I miss anyone, please correct me if there are any mistakes. The seminar focuses on the mechanics of unarmed defence against a commited knife attack. The seminar started with a small introduction by Sensei Alun Williams. Then the instruction started with familiarizing the participant with the basic angles of incoming attacks and how to read intention and body mechanics. In the 2nd half of the seminar, the participants were instructed body mechanics and changing from one position (height) to another without stopping thier fundamental blade movemenents. Feedbacks from the participants were very encouraging, more wanted to know about the Bruneian Martial Arts. For more information on future seminars please visit the seminar/events link on the right side of this page. For Images from the seminar please click here.